I'm sick of all this child play. get over it and vote for Gorsuch. He's more then qualified , enough already. Please, do not cave in to those Senators who want to re-write our Constitution, our history, and our values to suit their own anti-American drift. Most Americans are sick of this. We want America to be America, not some oppressive governmental institution... like Red China, Communist Russia of old, North Korea, and some family owned Arab States. JAMES J. from Anderson, IN signed. Democrat Senators,...stop your partison politics now!! !....otherwise YOU WILL PAY THE PRICE IN 2018! I am embarrassed by the democrats. Grow up! Republicans don't mess this one up - make sure you confirm Gorsuch by ANY means necessary. Don't even hesitate to go Nuclear if needed! Play by the Dems rules. Use the nuclear option. The democrats are never going to agree on anything President Trump is doing to fulfil his obligation to the conservative people. The democrats do not care about making our country great again. Their objectivity is power. There are two political parties and the Republicans won the 2016 election. Get it? Debbie G. from Boyd, TX signed. 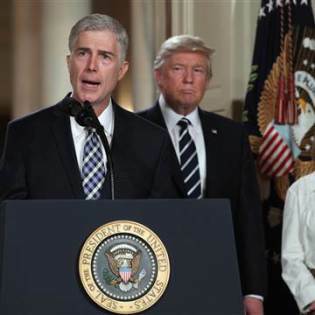 Neil Gorsuch interrupts the constitution correctly in my opinion. The Dems are doing anything to thwart what Donald Trump attempts to do in order to set our country straight. The liberals are playing like spoiled children. Grow up and be fair! Lynna D. from Longwood, FL signed. Samuel M. from Grand Blanc, MI signed. David W. from Livonia, MI signed. I realize you always vote along party lines and not for the good of We The People, but with all due respect, I'm asking you to please confirm Judge Neil Gorsuch for the U.S. Supreme Court. David A. from Fallon, NV signed. Democrates are absolutely sickening!!!! Lying horrible people.